Ground Penetrating Radar Systems (GPRS) was requested on site by a general contractor to perform a Ground Penetrating Radar (GPR) scan in Lakewood, Ohio. 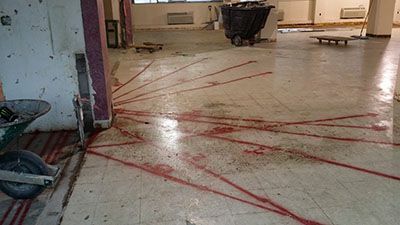 The purpose was to locate any conduits in or just below the concrete slab prior to saw cutting. Many conduits were located and marked out with depths in the area of concern. The contractor was doing demolition inside the building and wanted to use existing conduits without saw cutting through them. 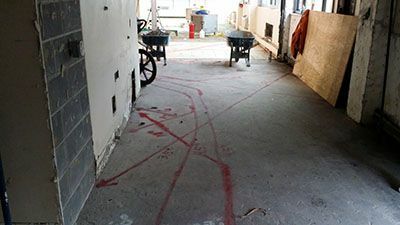 Ground Penetrating Radar Systems is the best way to ensure the locations of reinforcement and conduits prior to saw cutting/drilling through concrete. The pictures show all of the conduits located with depths to ensure that no conduits would be hit when saw cutting.